tomatoes. Top with a couple of pats of Goat cheese. Cover this with the other side of the breast and fasten with toothpicks that have been oiled with vegetable oil. 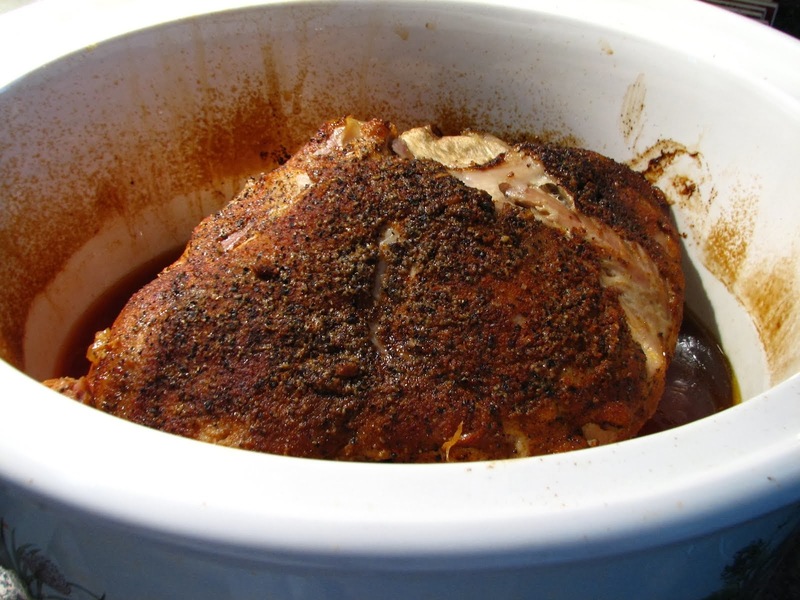 The oil helps you to be able to push them through the meat. Marinate for at least 1 hour. Grill over high heat until done. Each breast half will have a chicken tender on the cut side of the breast, so pull this off and save the tenders for another use. Rinse chicken with cold water and pat dry with paper towels. 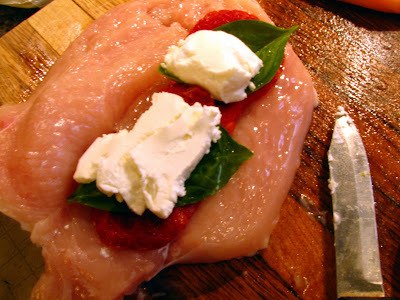 On a cutting board, remove any fat from the breasts. Carefully cut a pocket in 1 side of each chicken breast and lay it open. On one side place 2 sun-dried tomatoes, 2 basil leaves and a couple of pats of goat cheese. Fold each breast back over the stuffing and use 2 oiled toothpicks to close the chicken. Place chicken in a non reactive pan. Mix together the lemon juice, olive oil, garlic and salt and pepper and pour over the chicken. Cover and marinate 1 hour. I marinated this for 2 hours and loved the extra flavor. If using a charcoal grill, set up for direct grilling over a hot fire. Oil the grill well. Place chicken breasts over fire and grill for 4-6 minutes per side. 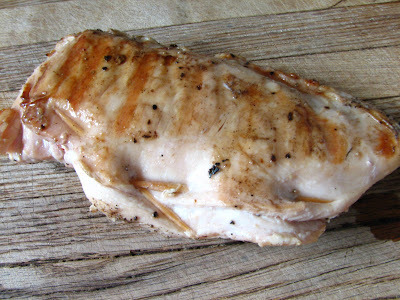 Remove breasts from the grill to a plate and let rest about 5 minutes before slicing. It looks wonderful sliced on a platter garnished with more basil, but would be fine just to plate it whole too. Enjoy! The lemon and garlic marinade was perfect with this chicken! The combination of goat cheese, sun-dried tomatoes and basil made for a perfect meal for family or company. We had 7 adult family members present, and 3 of them did not care for the goat cheese, and 1 or 2 didn't care for the tomatoes. But they all tried something new! Those of us who loved this dish were wanting the leftovers, which made a really great addition to a salad the next day! So next time I'll change to Mozzarella or Parmesan, but otherwise, this dish was a hit. Hope you give it a try! Lynda, what a perfect company meal! Oh my, I love this one!!! 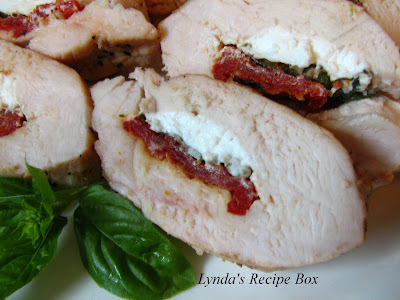 Wow, nicely done...love the sun dried tomatoes, basil and goat cheese in it. Yummie! I would really love this chicken - great flavor combination! I always shy away from stuffed chicken dishes because I'm always afraid of not getting the chicken pounded thin enough. This may get me over my fear.... YUM! Bookmarked! 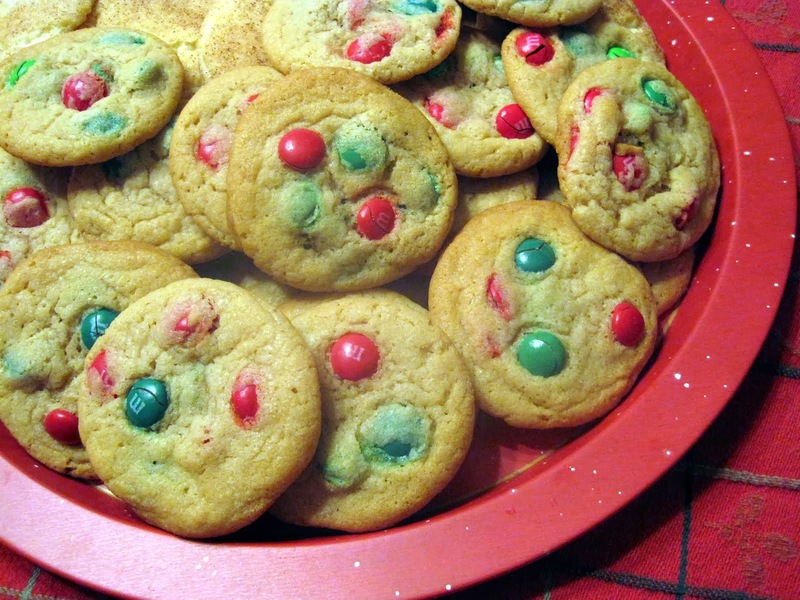 This looks amazing - I love all the flavors and ingredients you used. Those look fantastic Lynda. Delicious. I would love to try those! i have a powerful love for sun-dried tomatoes, and if it has to be surrounded by cheese and chicken, so be it. :) awesome dish, lynda! 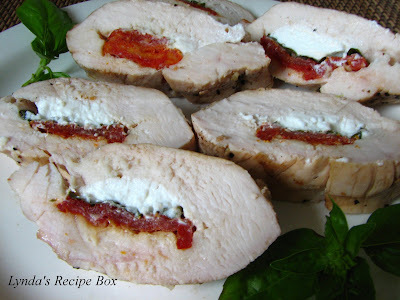 Love the blend of flavors- and I need another grilling recipe as the heat here is unbearable! This chicken is bursting with all the flavors I love! 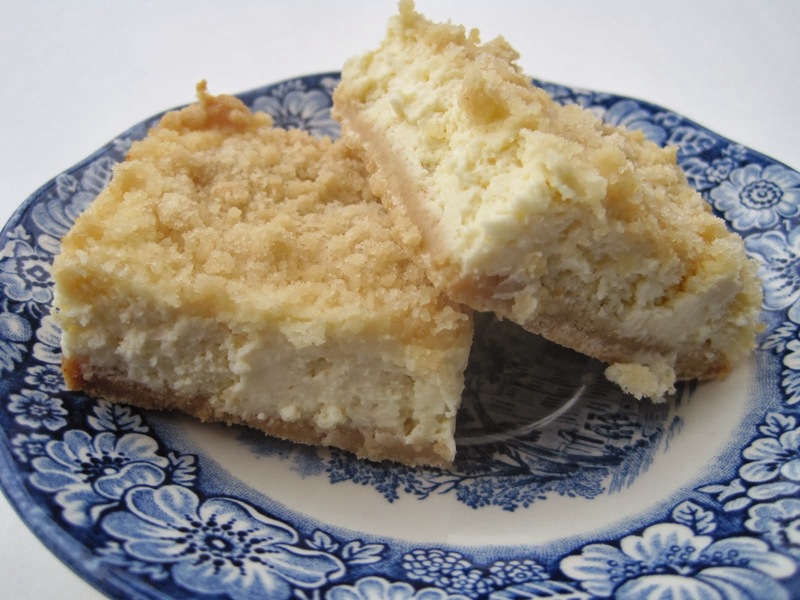 I've never made anything with goat cheese, but I bet these are absolutely delicious! It certainly is a dish I think would be perfect for when you have company over--it looks really "pretty"! I love chicken when it is stuffed. There is always a little surprise in each bite! Your blog is beautiful. Thanks for finding me, and I am looking forward to stealing ...ooops, I mean getting inspired by your blog. Great idea! What a special variation to grilled chicken. Looks delicious! That looks wonderful! I love Steve Raichlen too.